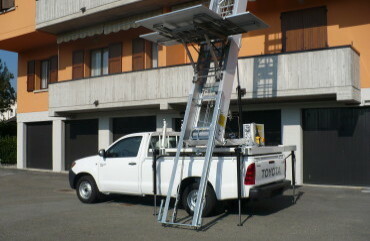 This unit is one of the most sophisticated aerial lifting systems for moving furniture into upstairs apartments. It features an especially rugged construction by reduced weight and dimensions. Designed for most varied applications and working conditions, this unit is capable of withstand in very high loads. 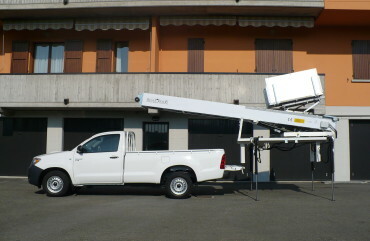 The DEDALO pick-up is specially recommended for working in narrow historical city areas where travelling and working is greatly facilitated by a compact size and a fully electrical very powerful power supply system (platform speed of 45 m/min.). Gasoline engine is also available on request. 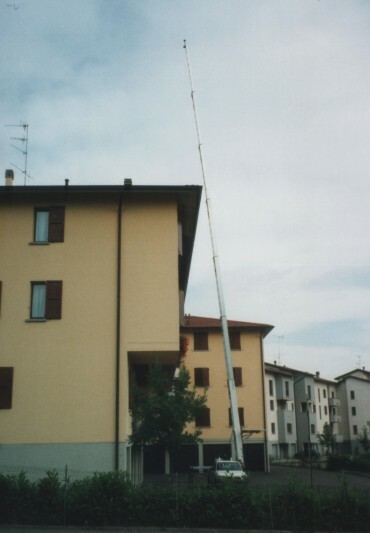 The highest ladder extension varies from 18 up to 36 m depending on which model and thus allows reaching out from first to eleventh floor with a unique performance. Designed in accordance with European Directive no. 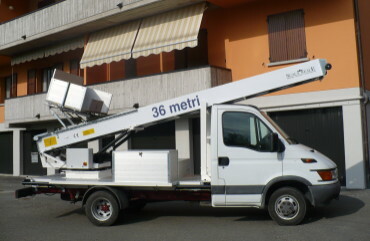 EC/98/37, this unit is entirely developed and manufactured by Scala Reale with special concern for operators safety. 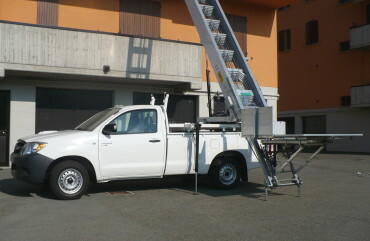 The above picture show a typical version of the pick-up model Dedalo 7.5050 (30.5 m high) mounted on TOYOTA HI-LUX 2WD pick-up, with 4 hydraulic stabilizers (standard) and gasoline engine (optional) with aluminium casing. 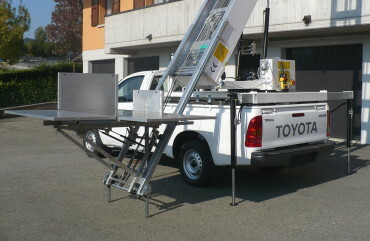 The above picture show a typical version of the pick-up model Dedalo 7.6050 (36 m high) mounted on IVECO DAILY truck, with 4 hydraulic stabilizers (standard) and gasoline engine (optional) with aluminium casing. 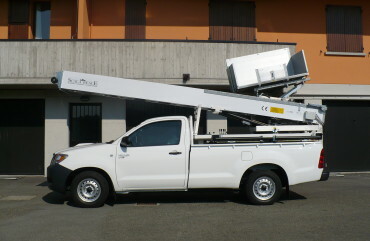 The maximum ladder height on TOYOTA HI-LUX 4x2 is approximately 2.4 m.
A wide storage room is also available on the truck to lodge the load. The ladder is quickly set out by simply removing the 4 fixation pins. Separation of the ladder on the pick-up is performed on special hydraulic stabilizers independently controlled via a hydraulic control valve with 4 individual joysticks. 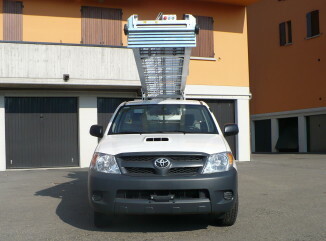 On request the ladder may be equipped with own wheels for travel to storage place. 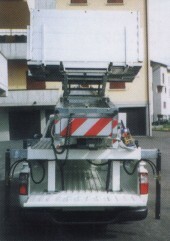 Operation of the elevating assembly may be performed independently from the truck. All 4 side panels are removable and are fitted with L-shaped steel brackets suitable for both horizontal and vertical settings. Turning platform dimensions to fit into windows opening: 1422x830 mm. Rear side panel: 650(h) mm. Lateral side panels: 450(h) mm. Front side panels 600x250(h) mm. All models from 24.3 m are equipped with a double cylinder controlling the ladder's inclination and avoiding twisting problems. The turning device has got a double braking system available: hand brakes to perform millimetric arrest and mechanical brakes featuring three arrest positions in each working position (the front and on the truck sides). 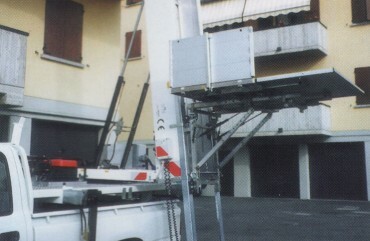 A safety system of stainless steel rods exclusively designed by SCALA REALE prevents the ladder unit from sliding down when load is put on the platform and saves the steel wire ropes from bending. A galvanized steel ladder extension ramp is equipped with telescopic prop to support it whenever the lower end is not standing on ground. 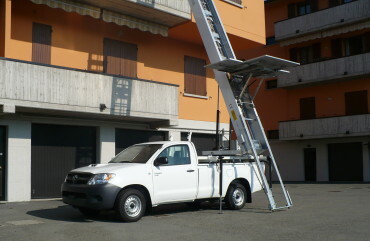 Quick locking and releasing of the ladder extension ramp are both performed by one single lever. All ladder elements are made out of heavy-duty aluminum 7020 avoiding ladder bending even at maximum extension (see picture).